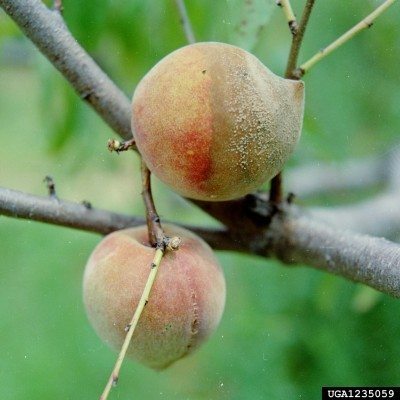 Brown rot fungus (Monolinia fructicola) is a fungal disease that can devastate stone crop fruits such as nectarines, peaches, cherries and plums. The first symptoms of the disease are often seen in spring with dying blossoms that turn to mush and form a grayish fuzzy spore mass on the branch. From there it enters the twig and cankers form. When maturing fruit is infected, the signs begin with a small brown rotted spot and rapid spore growth. The entire fruit may be consumed in a matter of days. 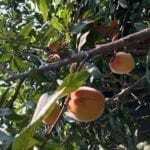 How to treat a fruit tree with brown rot fungus is of the utmost importance to the home gardener because the disease can and will occur again without proper precautions. For the home gardener, how to treat a fruit tree with brown rot disease is largely a case of prevention. For trees that are already infected, treatment with a brown rot fungicide is the only course of action. 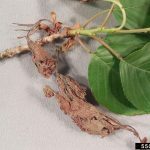 Diseased fruit and twigs need to be removed before the brown rot fungicide is applied. Most all purpose fruit tree fungicides are effective in the control of brown rot disease. Home brown rot control begins with sanitation. All fruit should be removed from the tree at the end of the of every harvest to prevent the rot from gaining a foothold the following year. Any damaged fruit (mummies) should be burned, as well as those twigs that are affected by brown rot cankers and even fallen unaffected fruit and twigs should be raked and burned as well. Fungicide should also be used regularly and as directed for each particular fruit. 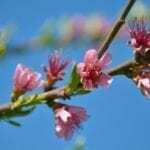 Start fungicide treatment in the early spring before flower buds appear and reapply the fungicide every two to three weeks until the peach tree’s blossoms have faded. Resume applying fungicide when the fruit start to get their first blush of color, which should be two to three weeks before you plan on harvesting. Since wet conditions are conducive to fungal growth, proper pruning is essential in the control of brown rot disease. Prune trees for maximum air circulation and sunlight. Home brown rot control should also include protection against insect injury. Even small insect wounds can create openings for the fungus to find a home. Brown rot control is an ongoing process covering all aspects of fruit development and insecticides or organic insect control is a part of it. 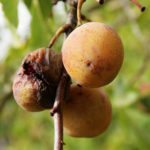 With proper attention to the routines that should be a regular part of fruit tree health, how to treat a fruit tree with brown rot will not be as devastating as it initially appears.